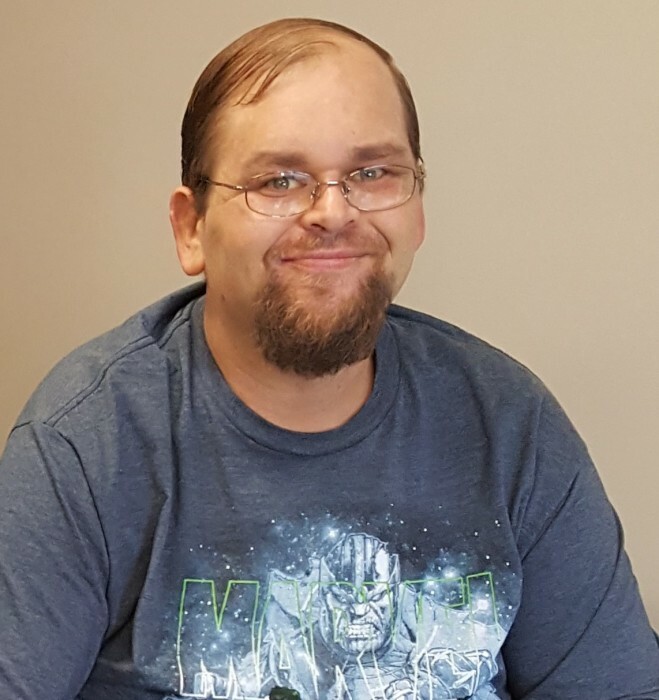 Robert Thomas Stover, 37, of Fort Seneca, gained his wings to heaven on November 16, 2018 at 12:05 P.M., lightsaber in hand, surrounded by his loving family at Volunteers of America Autumnwood Care Center. He was born on August 25, 1981 to Rusty and Connie (Lynch) Stover; his two children, the loves of his life, Aiden and Claudia; siblings, Kyle (Roseann) Stover of Mt. Angel, OR; Amanda (Tony) DeMonte of Tiffin and Derik (Nicole) Stover of Ravenna; grandparents, James and Sharon Lynch and Daryl and Brenda Stover both of Tiffin; nieces, Aniya and Bryn DeMonte; nephews, William and Phillip Stover; along with many aunts, uncles, cousins and special friends; including his Autumnwood family. Robert was preceded in death by his great grandparents; and his favorite fur baby, Daisy Mae. Robert graduated from John F. Kennedy High School in Mt. Angel, OR and went to culinary school in San Francisco, CA. Robert has been and S.T.N.A for the last eight years. He loved all his residents and they all loved him and his bubbly personality and big heart. In Robert’s spare time he loved to bake, read books, collect Nerf guns, was a Star Wars fan, but most of all he loved spending every minute he could with his children. Robert was one of a kind and had a heart of gold. He will deeply missed by many people. A Star Wars themed Celebration of Life was held Saturday, November 17, 2018 in the Chapel at Volunteers of America Autumnwood Care Center. The family would like to thank the staff at Autumnwood Care Center and Bridge Hospice for their wonderful care and compassion they showed to Robert. Memorial contributions may be made to Volunteers of America Autumnwood Care Center or Bridge Hospice.